Hospice du Rhone TTL Wines Selections Announced! So… are you completely sick of hearing about this Twitter Taste Live stuff yet? If not, check out the latest installment of Wine Biz Radio, which will air via podcast tonight at www.winebizradio.com, which features Thea of Vinquire.com, Craig from Bin Ends Wine & TTL, and Faith from Hospice du Rhone and me talking details about the upcoming TTL event on April 17th. What’s especially cool (well, to me anyway!) is that the wine selections for the East and West coast U.S. portions of the event have been announced! If you’re interested in the way-cool wines that I will be leading us through at 7PM ET on April 17, the details are included below. Get yourself over to the TTL website and RSVP – and get yourself over to BinEndsWine.com and order up the East Coast selections! Hospice du Rhône producers from California and Australia will be the focus of this event. Joe Roberts from 1winedude.com will be joining the Hospice to host the event live from the Wine Riot in Boston, Ma. 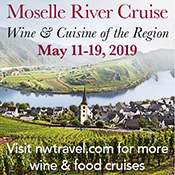 Join us and 500+ of your fellow wine and twitter lovers as we cruise through some of California and Australia’s top Rhône style wines.